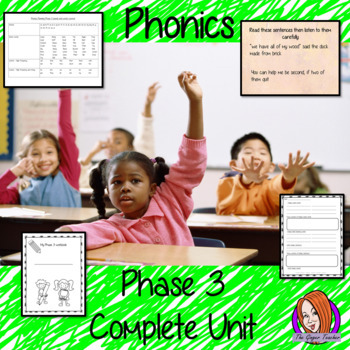 This download includes three weeks of phonics lessons for phase 3. 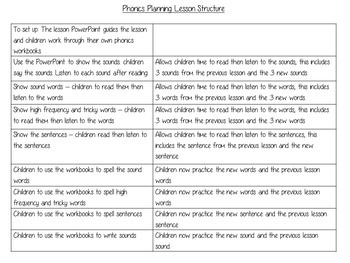 Fifteen full lessons each with PowerPoints, lesson structure and workbook pages. 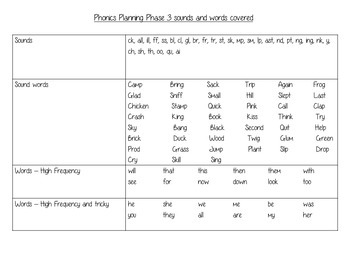 Tricky sight words and high frequency words are practiced alongside the sounds and sound words. 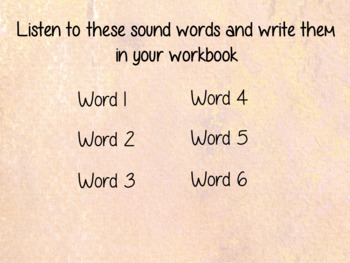 Audio is included in the PowerPoints to allow children to practice writing. Each lesson has silly sentences to make the learning fun. • Please go to your <strong>My Purchases</strong> page (you may need to login). Beside each purchase you'll see a <strong>Provide Feedback</strong> button. Simply click it and you will be taken to a page where you can give a quick rating and leave a short comment for the product. Each time you give feedback, TPT gives you feedback credits that you use to lower the cost of your future purchases. I value your feedback greatly as it helps me determine which products are most valuable for your classroom so I can create more for you.